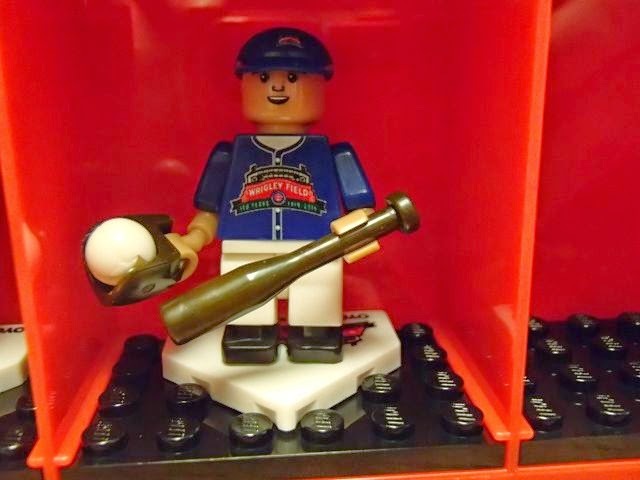 Earlier this month I was browsing the MLB.com shop to see what mini ballplayer Mik might choose when we went to the Wrigley Field 100th Anniversary game and found that they actually had a special 100 Year figure. 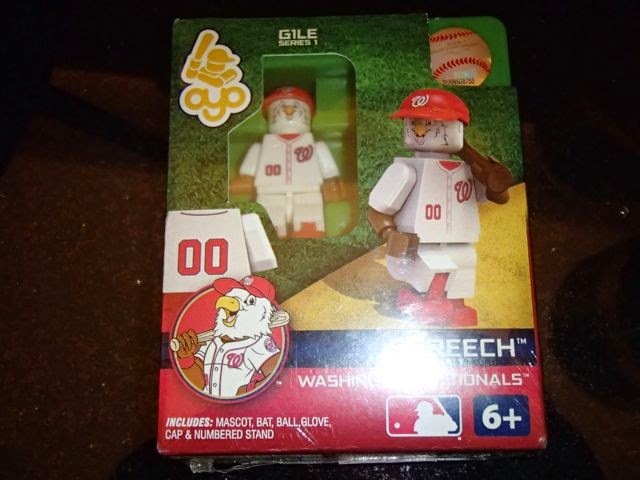 We decided to just order it online and not have to worry about finding it at the ballpark since we barely found Screech at the Nats Opening Day due to the crowded Team Store. Mik and Dad didn't have to deal with a crowded store since we were so early to the game, but they did find out that they were out of stock of the 100 Year figures and they currently are only available online anyways. 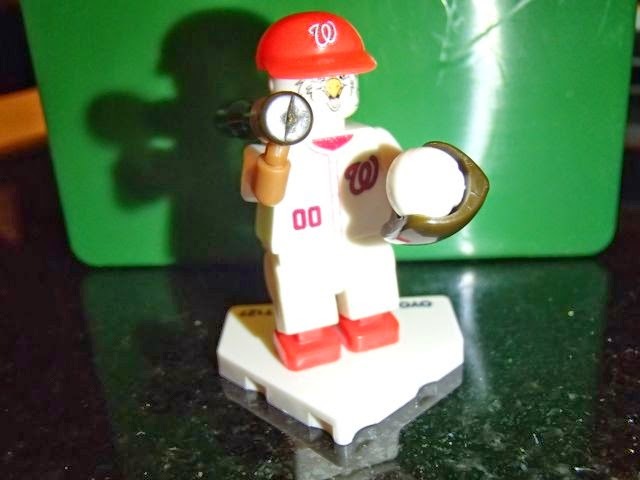 The 100 Year Anniversary Figure not only has the logo on the jersey and hat, but it also has it on the home plate base. I probably wouldn't have got this ball if I had gone into the store with Mik and Dad, but better they got too many than nothing. It seems I have a bunch of Wrigley ones with the brick wall and ivy design. 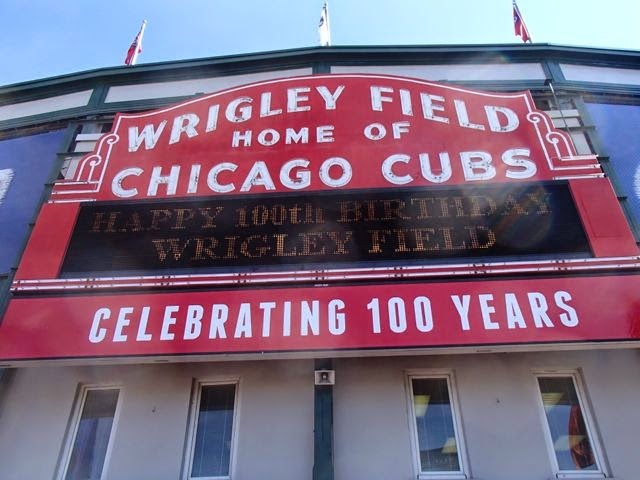 They are all slightly different and having one for the 100th Year of Wrigley is cool to go with the others, I guess. 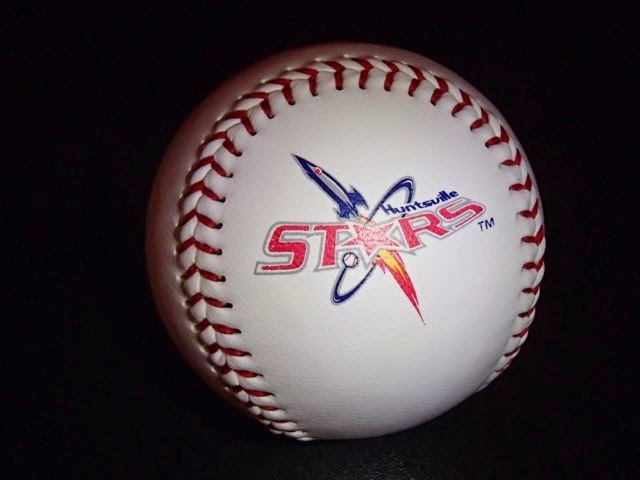 I just like the official ball better. 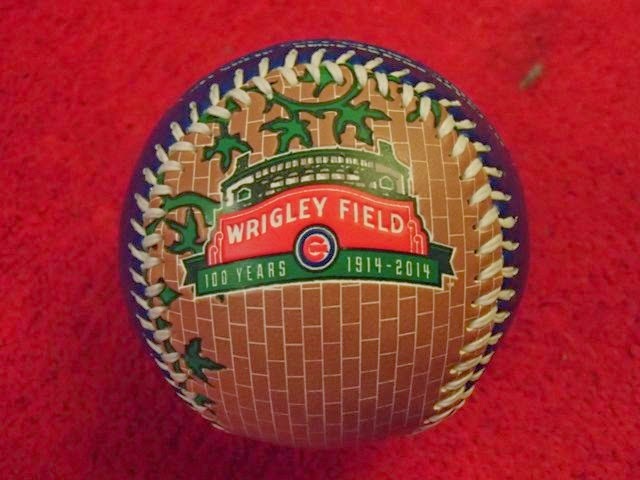 The official MLB ball with the Wrigley Field 100 Years logo is the one I wanted to get when we went to the 100th Birthday Game. 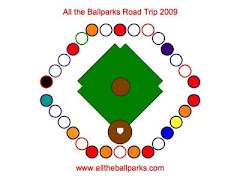 It is even cooler that they had the ones for the game, though, as they are only using this style today while the logo without the date is being used at the games at Wrigley all season. 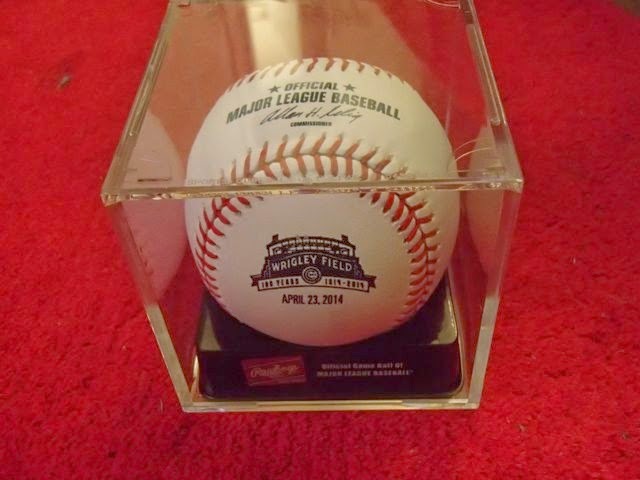 Of course, buying it is not as cool as getting one from the game, but better than nothing and actually I like it better than the other souvenir one Dad and Mik also choose for me (I was holding our spot in line to get in the park while they souvenir shopped before the game). 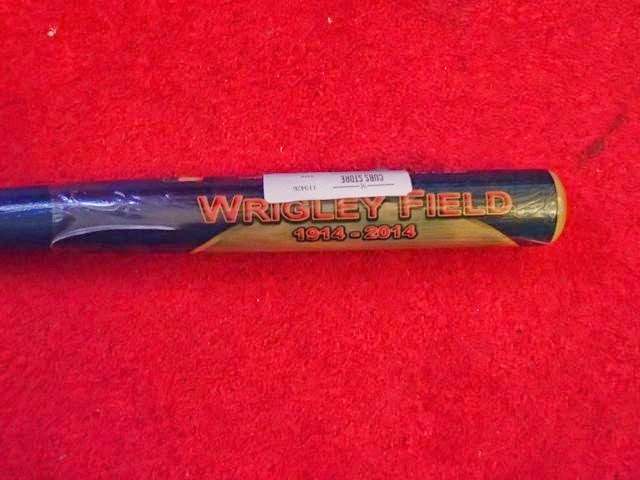 To commemorate going to the 100th Birthday Game at Wrigley Field, Mik got a Wrigley Field 1914-2014 bat for his collection. 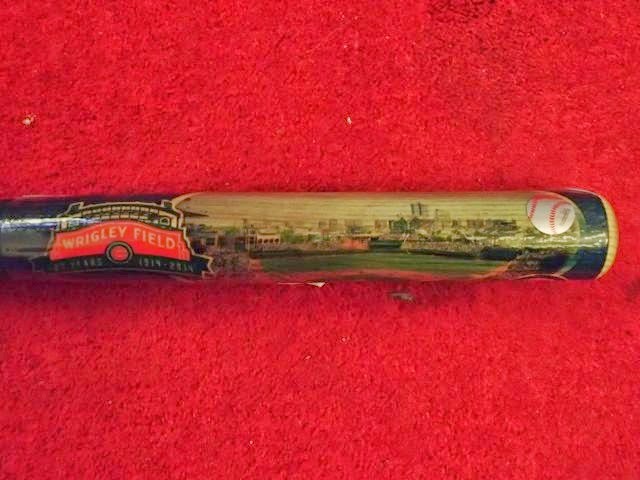 It has a ballpark view similar to the Wrigley Field bat he got on the ballpark trip, but it also has the 100 year logo and says Wrigley Field 1914-2014. The parking we got was the green lot, which is a few blocks from the park, but still very convenient. Not anywhere near as close and nice as the parking right by the park entrance we got on the ballpark trip, but still nice to know you have a spot before heading over there, especially for such a major game. However, the green lot is just dirt. There are no actually spaces, but they didn't say anything about Dad leaving a huge area between the truck and the car they said for him to park back up right next to. 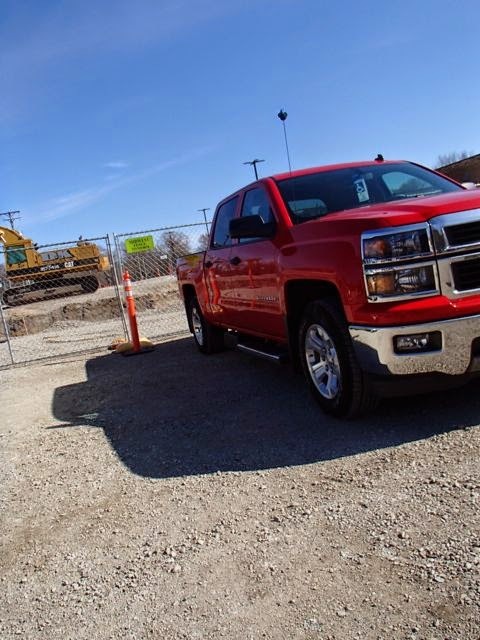 Rather disappointing parking situation after knowing they have good lots, but there is hope for the parking lot in the future because it is also clearly marked as being under construction. Section 208 has much less hope, though. Mainly we didn't like the section because you cannot see the scoreboard, which is our favorite part of Wrigley. Also, the seats are not raised up more than the normal step between rows, so Mik couldn't see anything once people started standing up for the pregame ceremony. This issue is made more annoying by the fact they have a bunch of TV screens there and they were just showing ads. 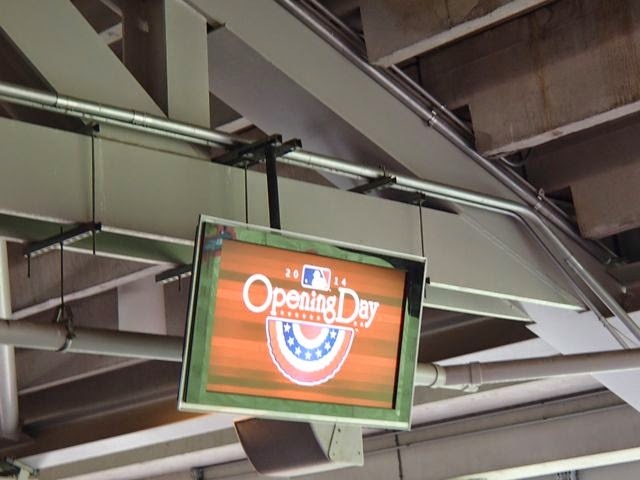 At least at Nats park for Opening Day when we couldn't see the scoreboard the TV screens there showed the pregame stuff even though the view of it was not actually obstructed. 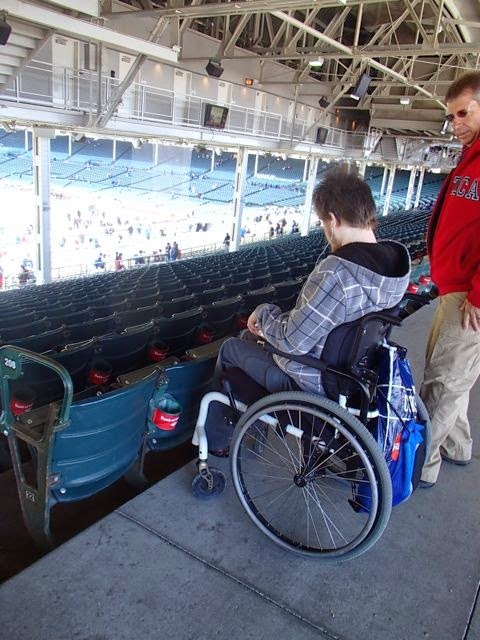 Next time I will pay more attention when getting wheelchair seats at Wrigley and pay the extra for those ones up another level and behind home plate as while they were the most expensive on the ballpark trip they are totally worth it for an enjoyable game experience. 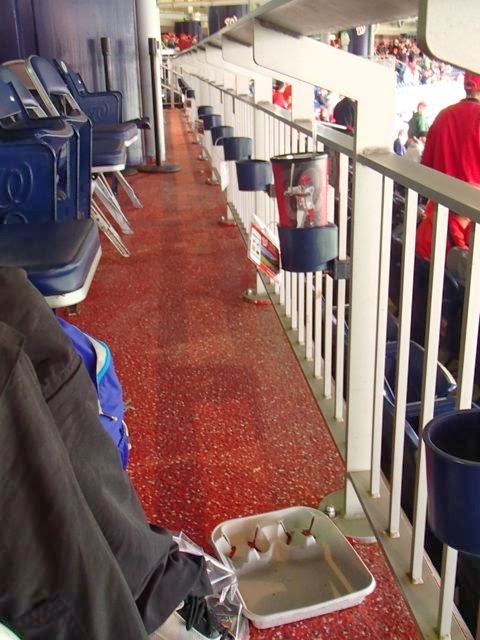 We will give them some credit for having cup holders for all spots in this area, which is good because while the rest of the 200 sections have cup holders I think there are still some regular sections closer to the field that don't have cup holders.. Also, the ushers are good at paying attention and bringing out the chairs for the companions. 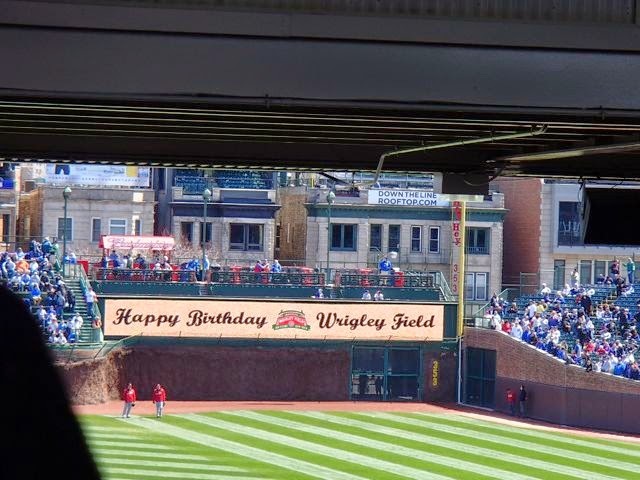 Happy 100th Birthday, Wrigley Field! 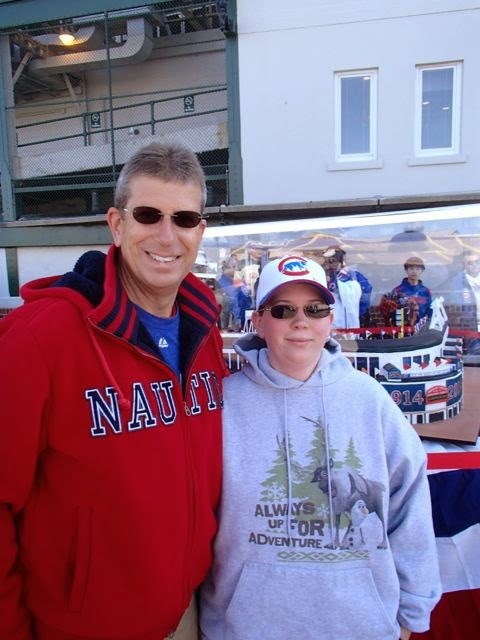 Since last fall we had been planning to go to a game at Wrigley Field during the 100th Anniversary season. 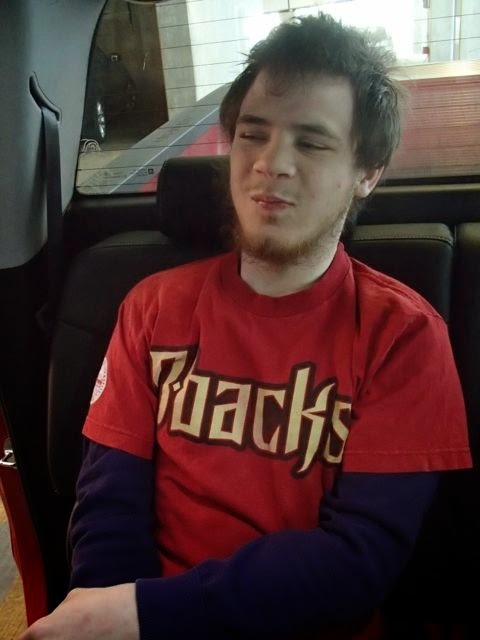 Mik choose that we go when the Dbacks were in town. We had settled on the Wednesday game of the series since Dad always has Wednesdays off and thus would not have to take as much time off to go. I did not even realize until looking about when tickets go on sale back in February that we had decided on the actual 100th anniversary date. We left for the ballpark around 9 a.m. thinking it would be best to get there before it was crowded. On the way Mik was a little hesitant about us ending up there too early, but in the end we were there by 9:30 a.m. and only a few people from the front of one of the lines in. By the time we got in the ballpark and were walking up the ramps to our seats we saw the line wrapped around through the parking lot, so it was totally worth getting there early. Plus, Dad and Mik got the souvenir shopping done at the Cubs store across the street to avoid the small crowded store inside the park. 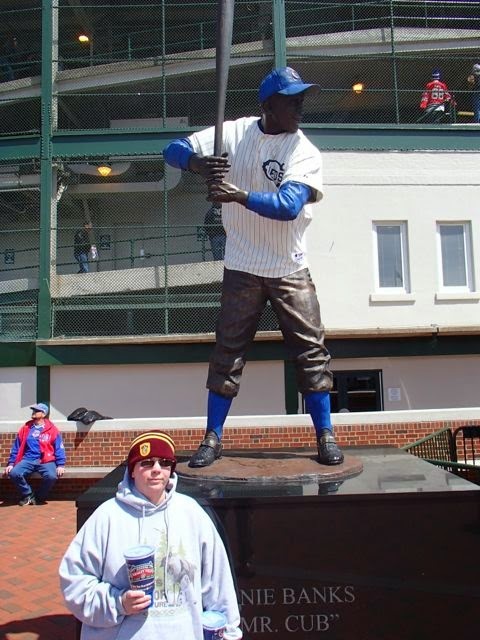 We also got to check out the Wrigley Field ballpark cake that was on display by the Ernie Banks statue, which was also dressed specially in a Federals jersey. 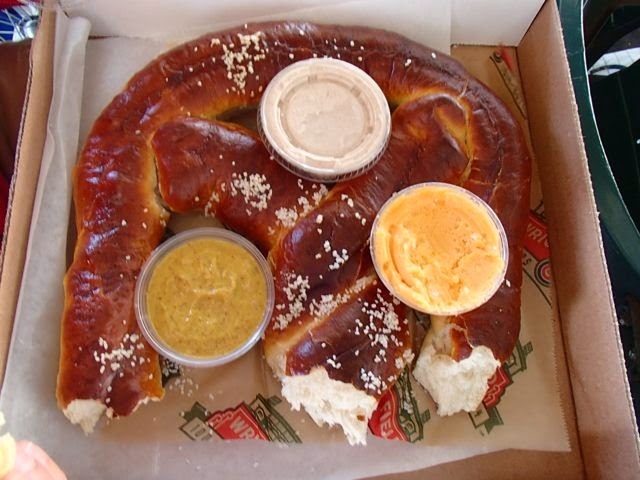 Once in the ballpark we got our favorite food in the whole MLB - the Northside Twist Pretzel. 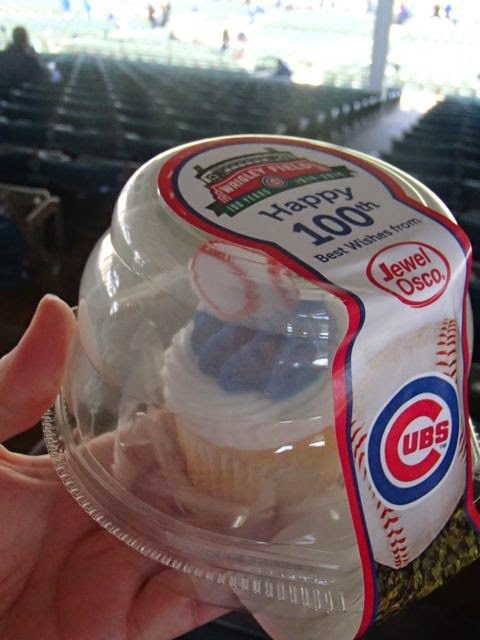 We also enjoyed eating the free cupcakes we got on the way into the ballpark. The weather was not so enjoyable, as it was in the low 40s. Waiting to get in the park was not bad, as it was in the sun, but once we got to our seats it was cold. We told Mik he just had to make it to the first pitch as his feet were already cold. The pregame stuff was kind of interesting with some of the past players (football and baseball) going out on the field and a 1914 ball being used for the ceremonial first pitch. The coolest thing, though, was seeing Bud Selig. No, not seeing him down there on the field. After the pregame ceremony, he walked right by us on his way up to the executive suites. That made up for us not being able to see the flyover from our seats. We left after the first pitch as promised, although I have to admit Mik did say he would stay as long as I wanted. Really, though, he already knew I was also could and I was not going to go back on my promise that we could leave after the first pitch because it cannot be good for him to have his feet so cold when he cannot move around much to stay warm. We ended up watching the game from the condo. It was sad to not be there for the Happy Birthday in the fifth and the seventh inning stretch being led from the field, but we would not have noticed the balloon release from our seats. 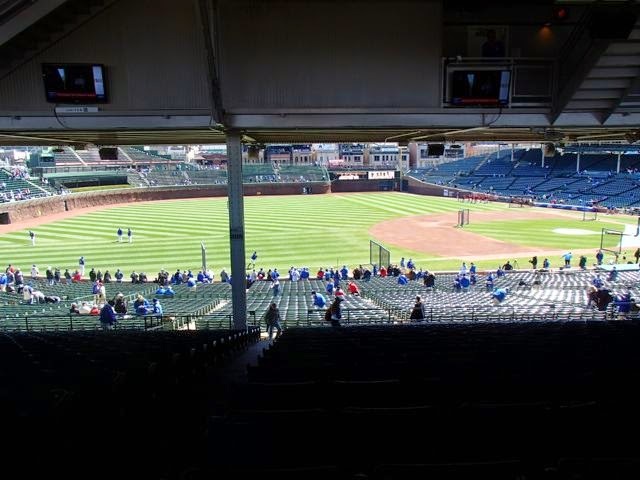 Seriously, if not for the Bud Selig encounter, I would have totally regretted the seat selection as you also cannot see the scoreboard (the best part of Wrigley!) from the wheelchair row at the top of 208. 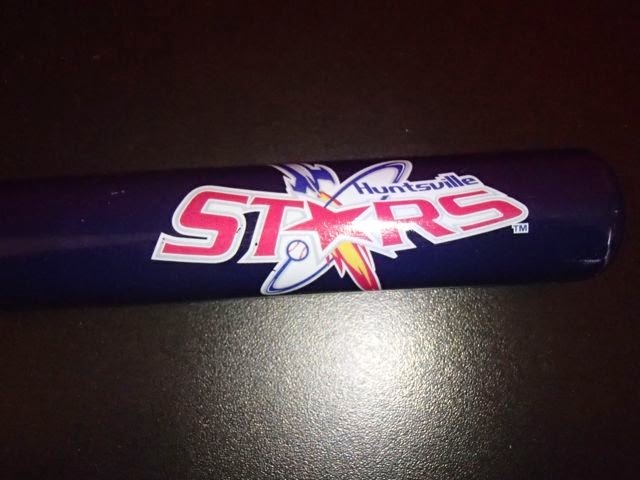 Dad and I choose a navy blue colored mini bat with the Huntsville Stars logo for Mik's Mini Bat Collection when we went to the team's final opening day in Huntsville. The team shop did not have much overall, but they did have six to eight different colors of mini bats to choose from. The red one also looked good, but we decided Mik has a lot of red mini bats and not many blue ones. 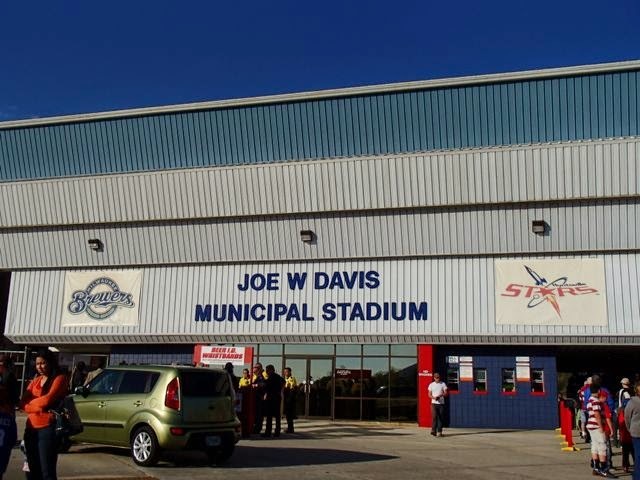 Yesterday Dad and I attended Opening Day for the Huntsville Stars at Joe W. Davis Municipal Stadium. 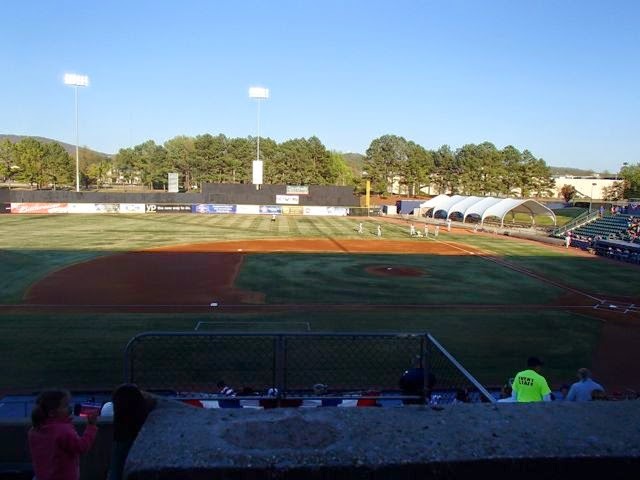 We had been meaning to go to a game ever since we moved to Huntsville last year, but never got around to it last season. 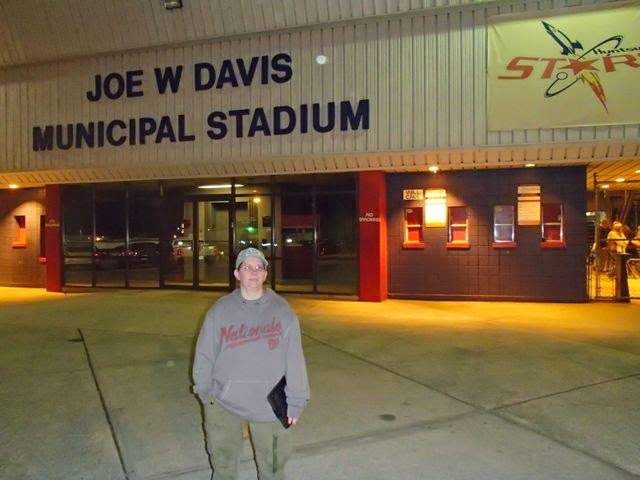 Now this year is the team's last season here, so we were more seriously planning to get to a game this season. I had given up on planning in advance a few weeks ago because I could not figure out how to buy tickets (turns out they gave up on selling tickets online because of glitches in previous years and the whole stadium is now general admission other than some season ticket seats). Yesterday we just decided to go when Dad read about it being Opening Day in the paper. We arrived at the park a little more than an hour before the game and located the ticket office just by guessing the little windows under the stadium name must be it. We then joined the small line to get into the park, which was shortly let in. After stopping at the gift shop for a mini bat and souvenir baseball, we walked the small concourse area to scope out the food options. 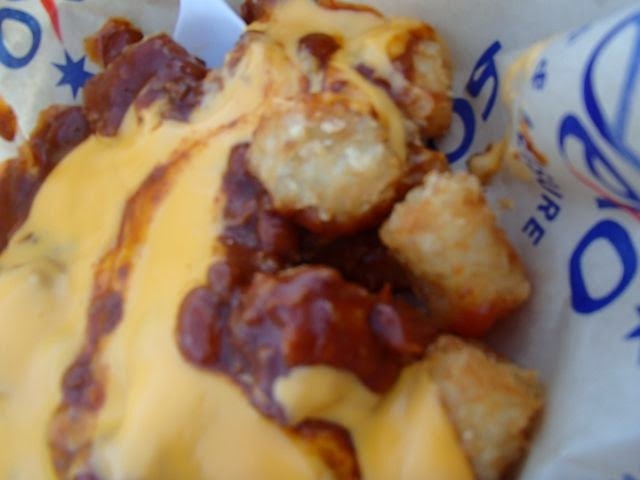 Pretty much just standard ballpark fare, but they do have tater tots are the stand on the first base side. I got the regular and Dad got the ones loaded with chili and cheese on top. We decided to sit in the upper section about in line with third base. It ended up being a good view of the whole field as well as the highest row where you could sit in the front row to avoid having someone tall block you. Overall an enjoyable game even though we only stayed until the end of the fifth inning because I did not want to stay out late having a lot to do this week and Dad getting cold. Mostly a rather plan and boring ballpark, although they have some murals in the hallways between the concourse and the seating sections. Since the only thing Mik has had at Nationals Park is a pretzel dog and food at the Diamond Club, he was not sure what to try this time. I told him that I used to enjoy getting Boardwalk fries when I came to games during the park's inaugural season. He decided to go with the fries and ended up enjoying them. 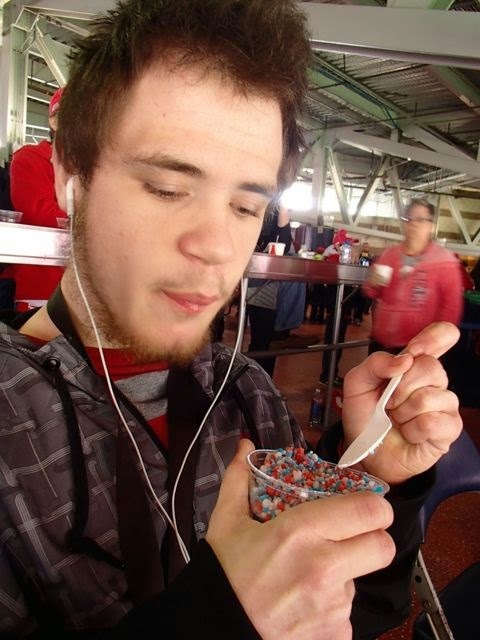 He also spotted Dippin' Dots and even though the weather was not that warm he also enjoyed some Nats Ice (similar to rainbow ice flavor, but has red, white, and blue dots). Afterwards he was full and said he has to come to another game because he still has not had just a hot dog at Nationals Park. Plus, there are plenty of other appealing food options here. For Opening Day 2014 we ended up with tickets in section 141. 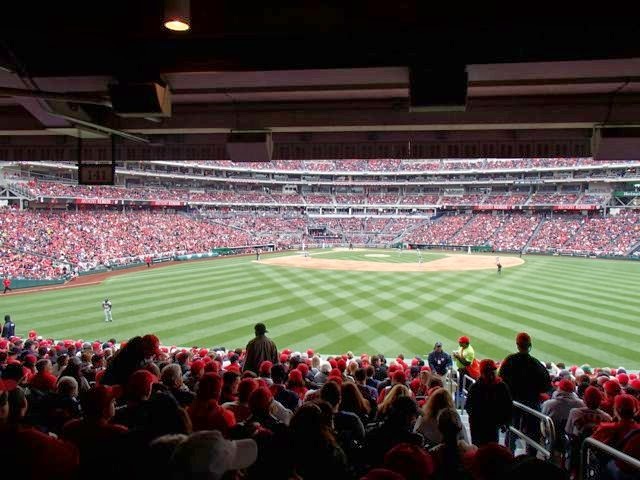 I would have preferred to be up a level, but certainly better than when Mom and I had seats one row from the top for the Opening Day six years ago when they opened Nationals Park. Also, good seats considering we only finally decided to go to Opening Day versus another game while in DC this weekend and this game ended up being a sellout with the second highest Opening Day attendance for this park. 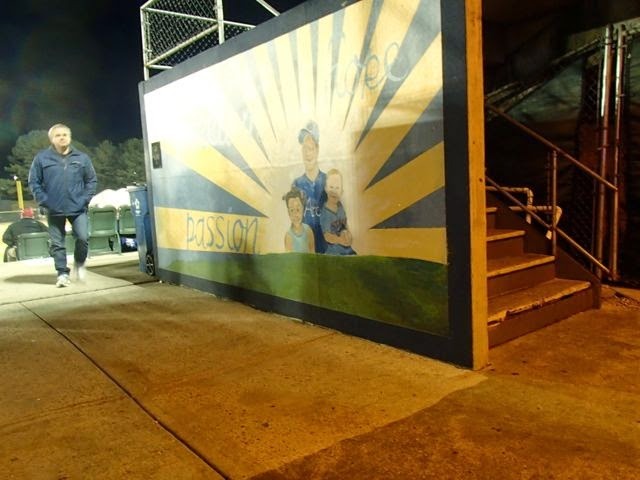 The main downsides to this section are you cannot see the scoreboard because you are under it and you cannot see plays that happen deep in the outfield in front of you. However, they do have TV screens showing the game, which are nicely placed sideways instead of straight in front of you. Thus, they are not obstructing the view, but are still easy to look over at. Mik was of course happy with the section because there were cup holders. The section had a standing view are behind it, but it was nicely separated and you did not feel crowded even though the concourse was very busy and we were on the end of the row. Overall section 141 was good, but I still like the view of the park best from the right field terrace level (sections even numbers between 222 and 236) and in particular 224. Maybe, I'm biased just from having sat there so many times when I had partial season tickets during the park's inaugural season, but I have sat in 236 and in left field mezzanine level (203 I think) and 224 remains my favorite. Mik also said he preferred the view from 224 at least based on his remembering it from the brief few minutes we sat in 224 before getting to go to the Diamond Club on the ballpark trip. Also, Mik found the speakers in 141 to be too loud and they really bothered him before the game when they are constantly on. I remember him having that issue a few years back at Chase Field. Both times those were seats on the main level covered concourse area and I don't think he would have a problem with the open area upper levels like 224 is.